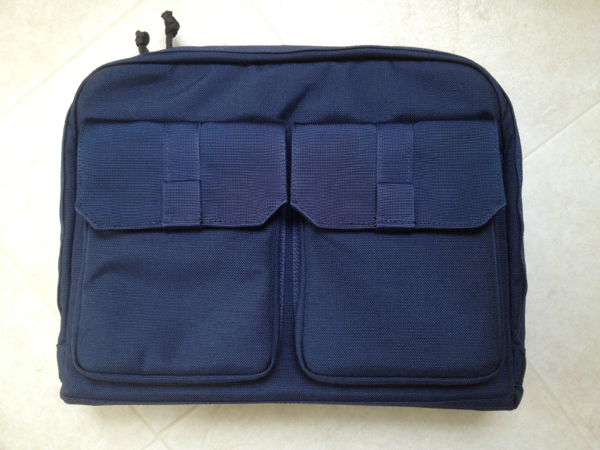 The RECON One iPad Bag – What Makes This iPad Carrying Case Stand Out? There are plenty of iPad bags and carrying cases available. What makes the Recon One from Alpha One Niner different? The answer is inside (and outside) the bag. Helm Ashiblie, creator of the Recon One, recently sent me a sample unit for review. What’s different about this bag? The answer is the Recon One flight caddy – a removable organizer that can hold your iPad and several accessories. See front and rear views of the caddy above. This handy iPad caddy clips to the pocket on an aircraft seat or the back pocket of a seat in the car. The caddy/organizer keeps your iPad and a few chosen accessories within easy reach, then attaches securely again inside the bag with wide Velcro strips when you’re ready to roll. The Recon One has plenty of pockets for accessories and a number of clever features. The larger of the expandable interior pockets has a small opening in the bottom for routing a cable and there’s a little pouch for excess cable sewn to the bottom of the bag. 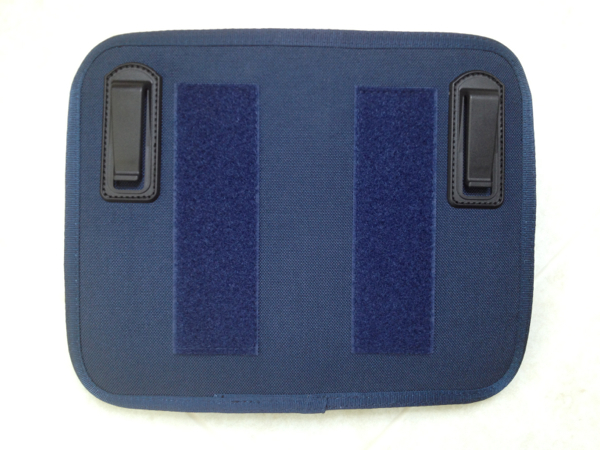 The tablet compartment (flight caddy) also includes a convenient opening for connecting a charging cable. 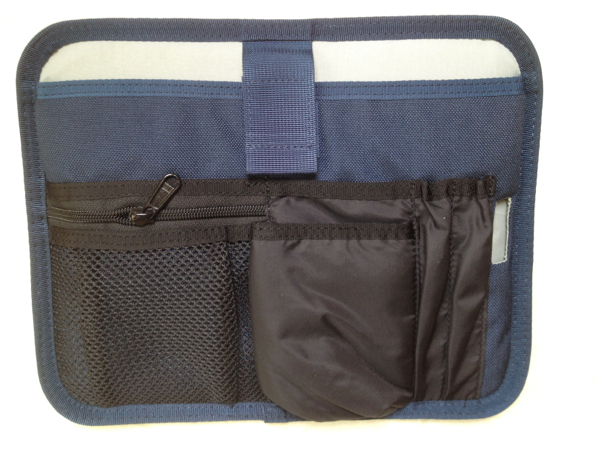 This combination of pocket, cable wrapper and caddy is ideal for use with a portable battery (not included) to keep your iPad charged on the go. Just be sure to match your iPad connector to the caddy opening when you slide the iPad into the caddy. Two exterior front pockets are well padded and there’s room behind each one for slimmer items. The back side has a slim, multipurpose compartment running the width of the bag that can hold a few folders or a magazine. 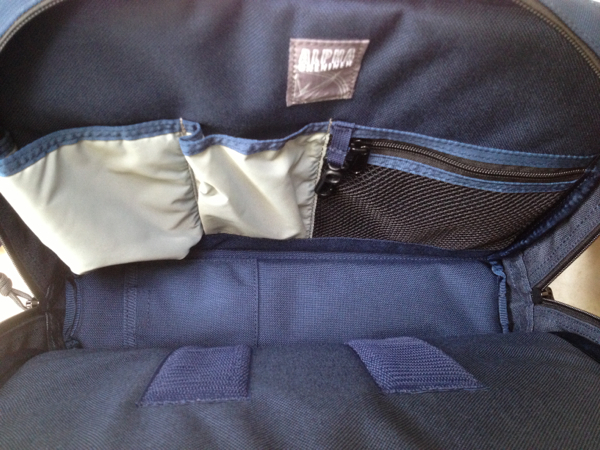 The bottom edge is slotted, making it easy to slip the bag over the handle of your carryon luggage. 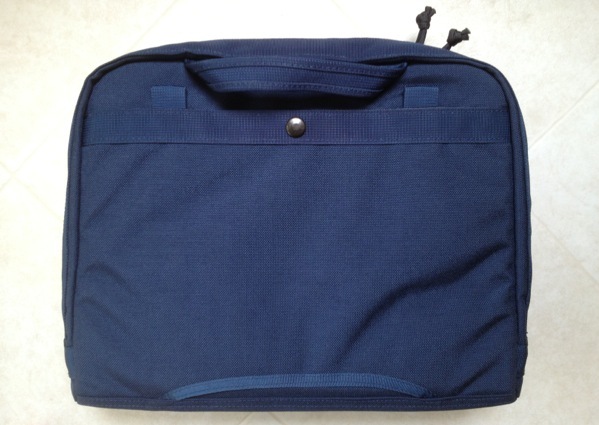 A single, fabric carrying handle is attached and a shoulder strap is included with the case. You may find the snaps for the shoulder strap a little tricky. 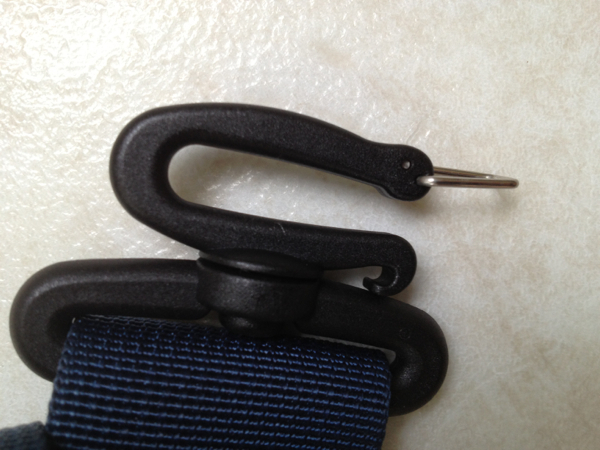 When the metal clip on the clasp is closed, the plastic clasp is rigid. To release the clip and open the clasp, you need to slip the metal clip back a bit, then squeeze the plastic clasp. 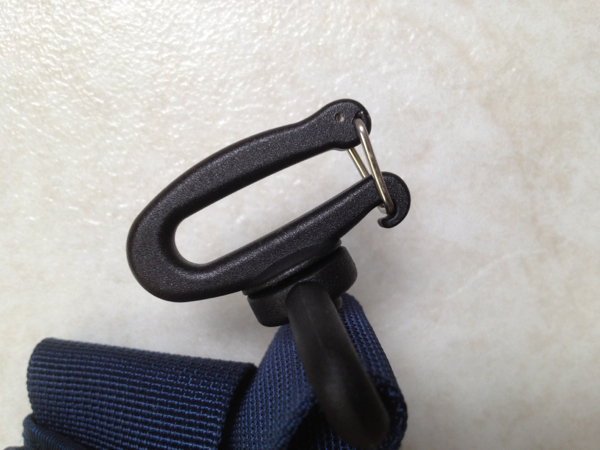 This clears the opening on the plastic clasp so you can attach it to the fabric loops on the exterior of the bag. Overall, the Recon One is well designed and appears to be reinforced at all the stress points. However, I did notice two items that might be improved. A zippered front pocket would be more secure than the current magnetic closure. Speaking of zippers, the lacing of the zipper pulls is no doubt strong, but the knotted ends are a bit rough. I should also note that while my iPad with a rear case and cover fit easily into the caddy, thicker iPad cases could be a little snug. Helm is marketing the Recon One primarily as a iPad flight bag, but I think this misses the mark. The Recon One is a great everyday bag and has become my primary transport when I need just the iPad and accessories. I haven’t had to fly since I received the Recon One but I’m looking forward to the convenience it will add to my next trip. You can see a video tour of the Recon One. See all the Alpha One Niner products at this link.